CALA Trainer, Oded Netzer continues to train and certify leaders in Israel. 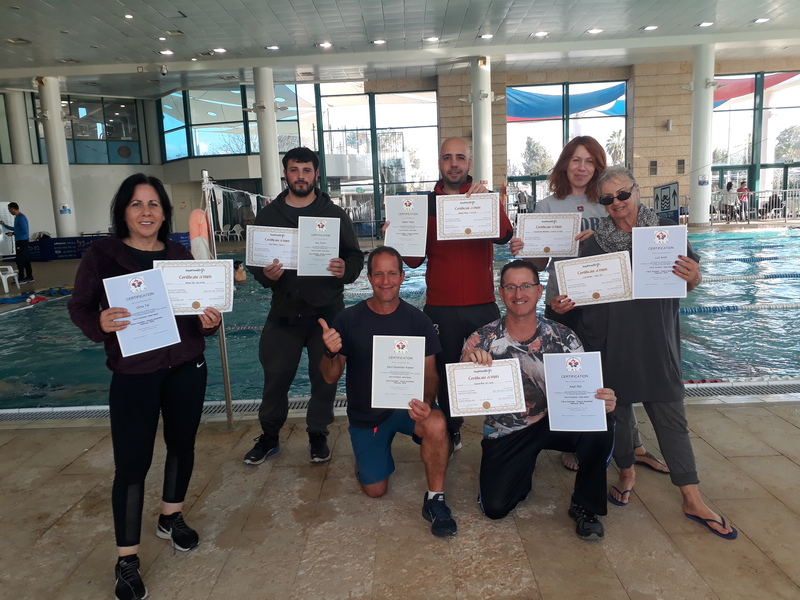 We are proud to feature the recent CALA - Total Fitness Israel Group Aquafitness Certified Leaders, February 2019. CALA is launching a 60 hour comprehensive Combination of Courses at the Wingate Institute, in Israel, November - December 2010. The comprehensive course will include the CALA Foundations of Vertical Water Training: The Charlene Kopansky Method, the CALA Group Aqua Fitness Specialty Training and Certification and an Introduction to the Water Running and Aqua Kick Box Specialty Certifications. CALA Pioneers.... Congratulations to the CALA Pioneers. We just completed a very successful launch of the CALA Foundations of Vertical Water Training and Group Aqua Fitness Training and Certification in Israel at the Wingate Institute, Netanya from December 2-8, 2010 with Master Trainer and CALA Founder and President, Charlene Kopansky and Apprentice Oded Netzer. In Hebrew, the meaning of CALA is Bride, in a wedding. We are very happy to be the Groom of the Bride, for this first CALA program in Israel. We hope that you felt in love with us and in our country as we fell in love with you. Thank you for a week of very rewarding and intensive study that helped us to grow and become enriched. We enjoyed every moment. We will be happy to be in contact with you and with CALA.